End stage renal disease, or ESRD, is the last stage of chronic kidney disease (CKD). This means that the kidneys are functioning below 10 percent of their normal function, and they can no longer support a person’s day-to-day life. At this stage, the kidneys can no longer remove waste and/or excess water from the patient’s body. ESRD usually comes after chronic kidney disease. The kidneys may slowly stop working over several years before ESRD results. When ESRD is diagnosed patients need dialysis or a kidney transplant to stay alive. Dialysis removes waste from the blood and/or excess water when the kidneys aren’t functioning. It may be performed either at a dialysis facility (in-center) or at home, using home hemodialysis or peritoneal dialysis if the patient is a good candidate for one of these treatments. A kidney transplant is surgery to place a healthy kidney into a person with ESRD. The patient’s doctor will make a referral to a transplant center, where the patient will be evaluated by the transplant team to make sure the patient is eligible for a kidney transplant. 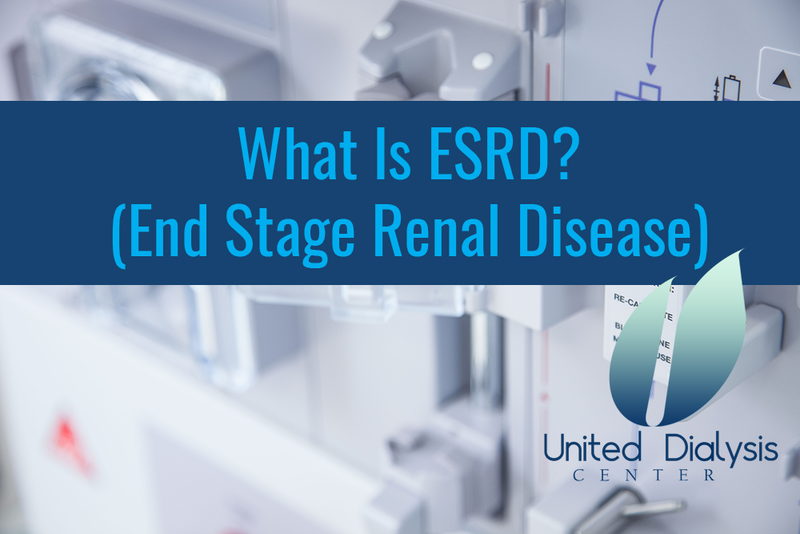 ESRD is a life-threatening condition, but dialysis or a kidney transplant makes it possible for more than 550,000 patients in the U.S. to live with the disease. Contact United Dialysis Center by calling (754) 307-1536 today!